After unpleasant cold and windy Saturday, that we spent taking part on annual count of wintering White-tailed Eagles at Danube, we realized that winter hasn’t showed all its powers during the weekend. Roads and sidewalks next to the Hrušovská zdrž water reservoir were covered in ice and freezing rain started to pour on our heads. Despite these bad weather conditions we could welcome a group of 20 birdwatchers and nature lovers. At first we walked, or slided in other words, to the Danubiana modern art gallery. On the water, ruffled by wind, we observed sleeping Common Mergansers (Mergus merganser). Beside them we found few Common Goldeneyes (Bucephala clangula) and diving Great Crested Grebes (Podiceps cristatus). Meanwhile we made a short comment on the importance of this area for wintering waterbird species and on the nature conservation issues in the region as well. As we moved on, some of the participants spotted White-tailed Eagle (Haliaeetus albicilla) in the distance. Then we stopped by the smaller flock of Common Pochards (Aythya ferina) and Tufted Ducks (Aythya fuligula), most numerous bird species wintering in the area. We passed by a few Mallards (Anas platyrhynchos) and three Coots (Fulica atra) as the freezing rain was getting stronger. 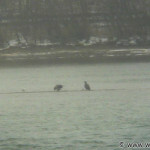 Couple of Great Cormorants (Phalacrocorax carbo) and Grey Heron (Ardea cinerea) flew over our heads. As we looked below the dam we found out that in the shallow is another White-tailed Eagle. One of them was young bird, the other one was an adult. We had a possibility to compare their majestic size to the Hooded Crow (Corvus cornix) and one large Gull (Larus sp. ), that were close to the pair of these raptors. 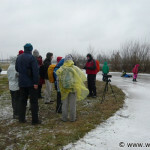 As the weather was getting worse we decided to finish our guided bird walk. We gave away stamping cards with the first stamp to the participants that were interested in our all year long competition. We are glad that our guided walk was visited by a reasonable number of nature lovers despite the harsh weather conditions. We hope that our next guided walk will occur in more pleasant weather.